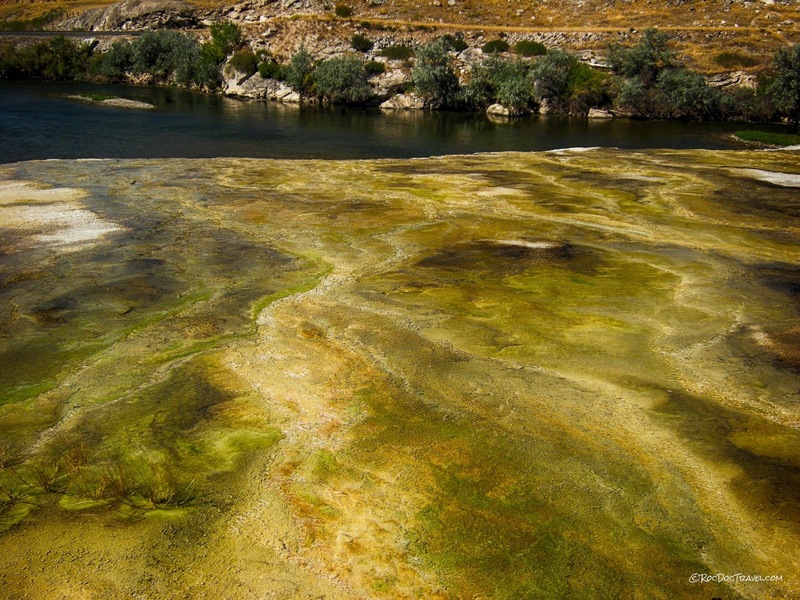 What You'll See: Thermopolis is home to gigantic, colorful hot spring deposits with adjacent pools and a water park, all set in a green, oasis-like state park. 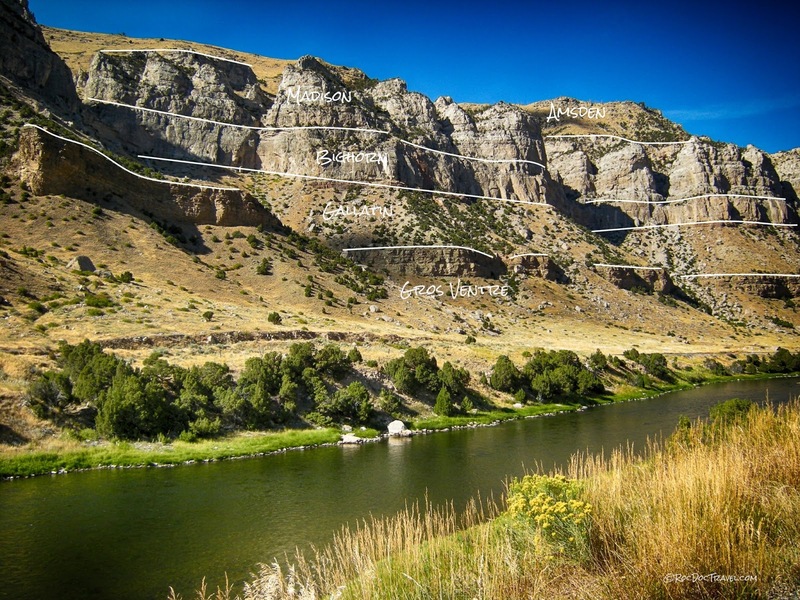 Wind River Canyon is famous among geologists for its extensive and scenic exposures of rocks in age from over 3 billion (Archean) to 220 million (Triassic) years old -- that's most of Earth's history! The Wind River has cut this canyon -- paradoxically -- right across the Owl Creek Mountains that were uplifted 70-50 million years ago. Interactive Google Map. Zoom in and out. Grandiosly named Thermopolis is located in the center of Wyoming. Geologically, it's on an anticline in the southern Bighorn Basin. 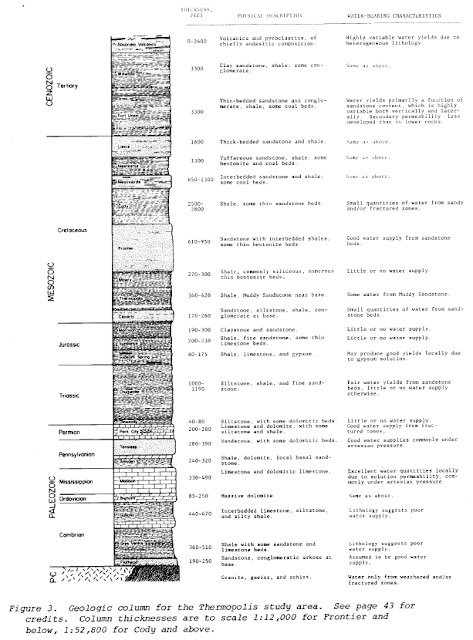 This thick deposit of sedimentary rocks (geologically, a "basin") has produced 2.4 billion barrels of oil and 1.7 trillion cubic feet of gas since 1906. Aerial view looking west at Thermopolis. The balloon marks the location of Hot Springs State Park. Wind River Canyon is located just south of Thermopolis on U.S. 20. Getting There: Thermopolis is at the intersection of U.S. 20 and Wyoming 120. From Yellowstone 14/16/20 & Cody, take Wyoming 120 south. From Casper, take U.S. 20/26 west to Shoshone, then U.S. 20 north. From Lander, take Wyoming 789 east to Shoshone, then U.S. 20 north. Vehicles: Any. The highways are easy travel for miles around. A few RV parks are available. Seasons: The State Park is open year-round, but winter travel on Wyoming highways can be impossible. I suggest May - October. It never gets very crowded. Accommodations: Thermopolis has several motels, but the setting of the Best Western Plus Plaza in the Hot Springs State Park has to top the list. Next to it is the Days Inn Thermopolis, also in the park. 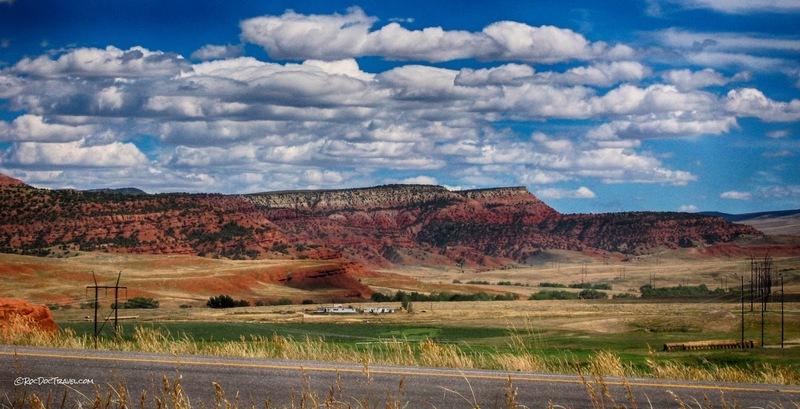 Camping: The Thermopolis area is curiously short on campgrounds. 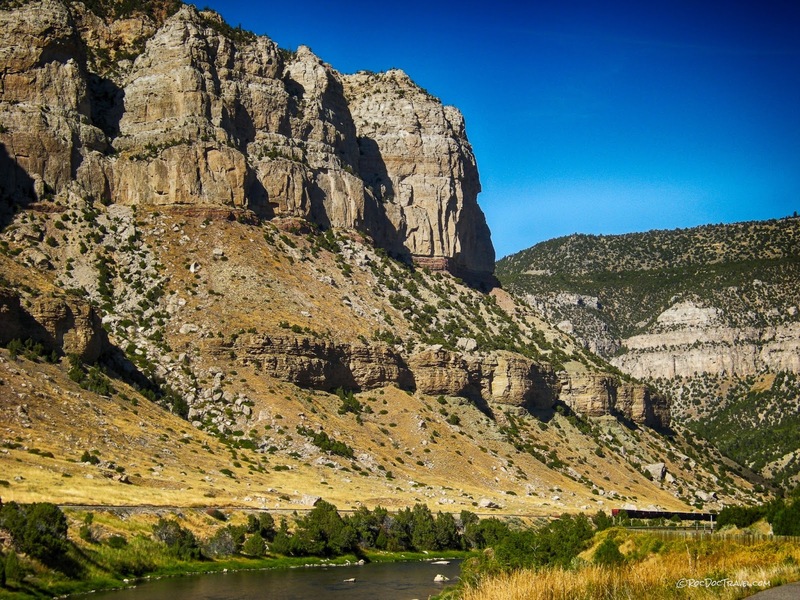 There are RV parks north and south of town, but the nearest campground is at Boysen (reservoir) State Park at the south end of Wind River Canyon. Accessibility: Anyone can visit the hot springs and the canyon! That's the way -- uh-huh uh-huh -- I like it! Considerations: Bring your swimsuit! Both the canyon and the hot springs are wonderfully simple to visit. The "World's Largest Mineral Hot Springs" are located at the NE end of the town of Thermopolis. Directions to the park are well marked by signs, and easy to follow. You'll go under railroad tracks and over the Bighorn River to get there. 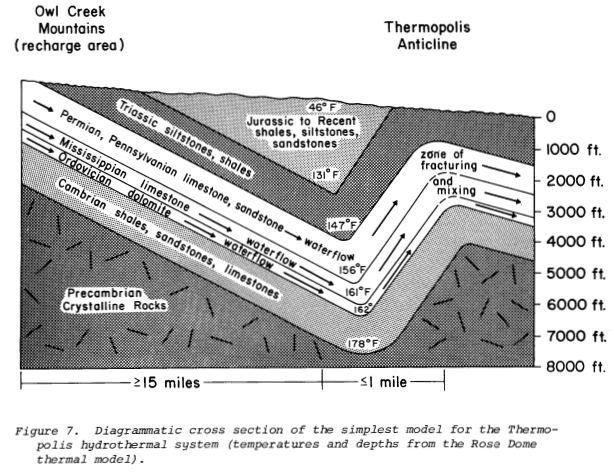 The warm spring waters flow upward along steep faults in the crest of a large anticline. They're warmed at depths of about 6000 feet by the natural geothermal gradient, which here is much higher than the regional 15 degrees (F) per thousand feet. No evidence exists for a magma body at depth, even an old one. From the highway, you can see the broad terraces created by the spring's copious calcium deposits. They extend right out into the Bighorn River. The Bighorn River has maintained its channel through the ever-growing spring deposits. It's quite a good place to swim! 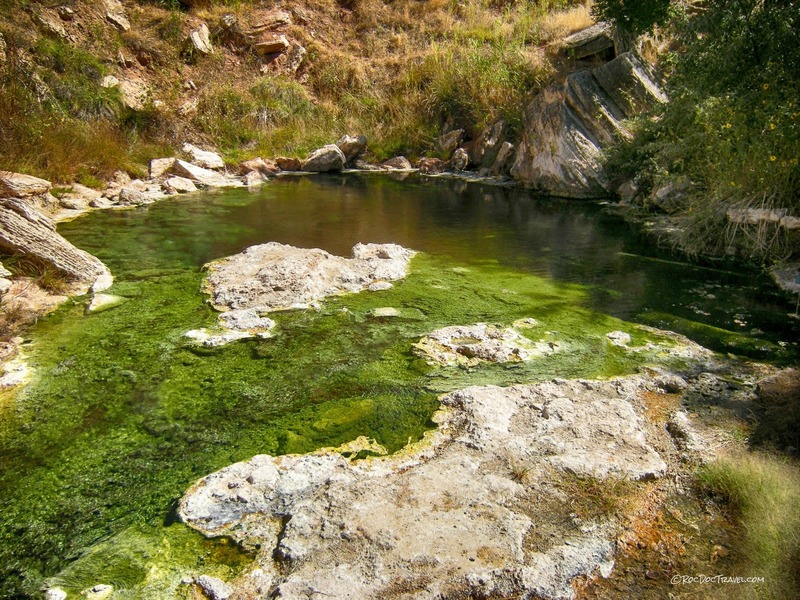 The springs flow at a rate of 3000 gallons per minute and a temperature of about 130 F (54 C). As you can tell, the water is extremely hard with calcium, which forms these terraces and bulbous cliffs where it evaporates. Looking south from the cable bridge (below), the spring deposit's lumpy cliffs are an impressive sight. The dome and water structure are at the State Park. 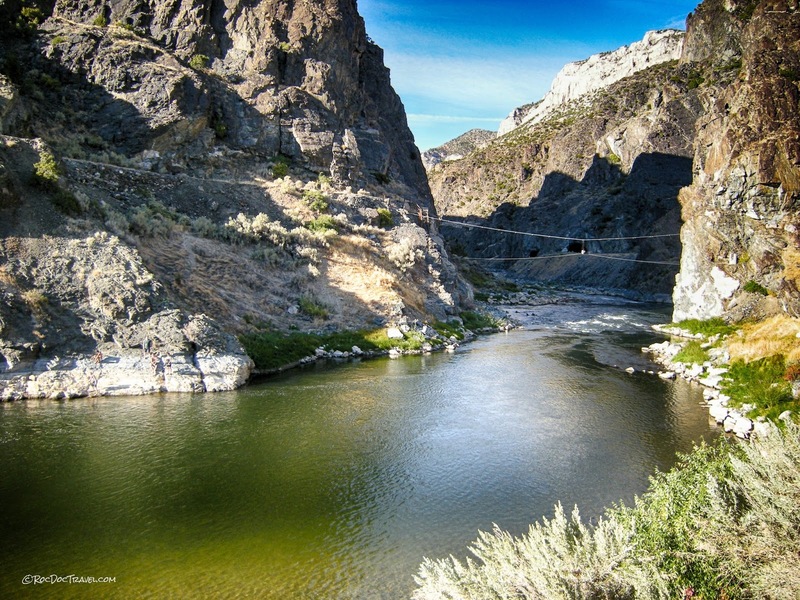 Take a minute to walk across the cable bridge over the Bighorn River. Gulls placidly enjoy the infinity edge to the spring terrace pools. The boardwalk takes you up close and personal across the spring terraces. This is one of the main hot springs. The colors are mostly microbes that thrive in hot water. Enjoy their colors! Thermopolis is enjoyed best by staying overnight and taking time to have fun in the pools and slides. There's also a bit of beach at the park, so bring a swimsuit even if pools aren't your thing. This mound of hard water deposits, called Teepee Fountain, is from a vertical pipe planted there in 1903. It's about 20 feet high now. OCD cleaners approach with caution! Here's a wide look at the park, looking southward. The Best Western is the brown building on the right. Just a couple of miles south of Thermopolis, highway 20 crosses the distinctive redbeds of the Triassic Chugwater Formation. It was deposited along the coastline before any Rocky Mountains existed. The red color is small amounts of iron deposited along with the sediments, that has since rusted. The highway joints the river where it cuts across the Owl Creek Mountains. 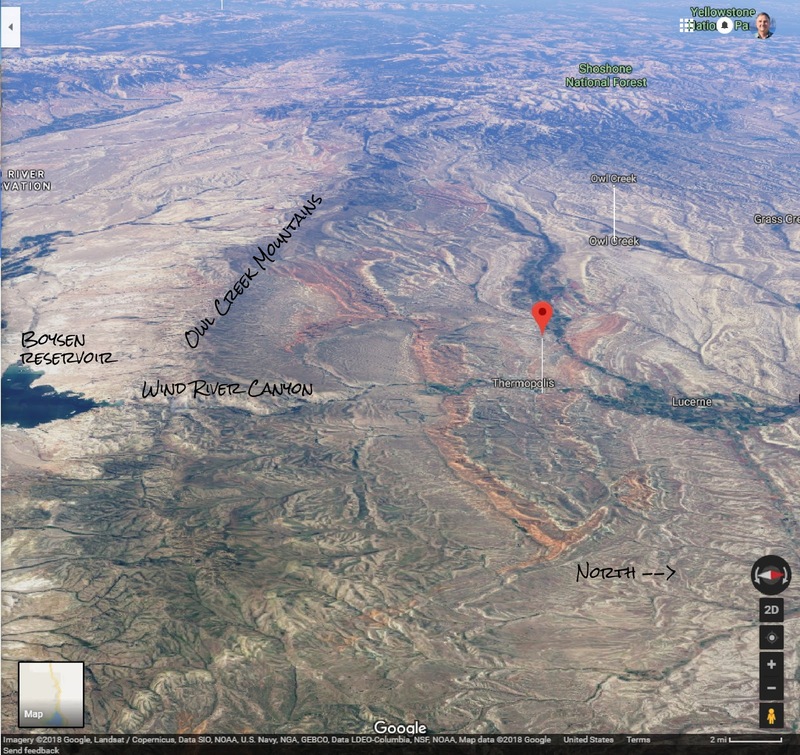 This Google Maps 3D view looking south shows how Wind River Canyon is cut straight across the Owl Creek Mountains (called the Bridger Mountains east of the canyon). In geologic terms, that means the river course was there before the mountain was uplifted. 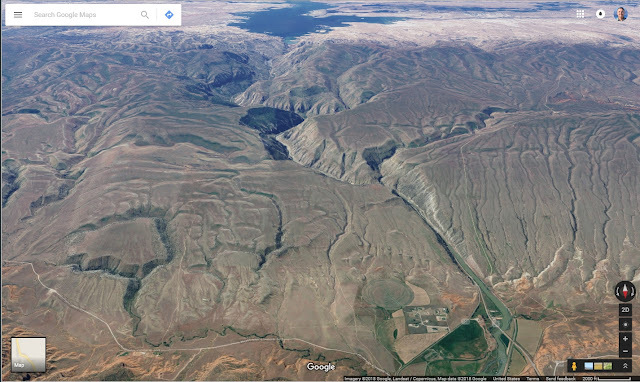 It may not have been the same river elsewhere, but at least here a drainage existed before 70 million years ago. Geologists love highway departments that create beautiful roadcuts like this one! 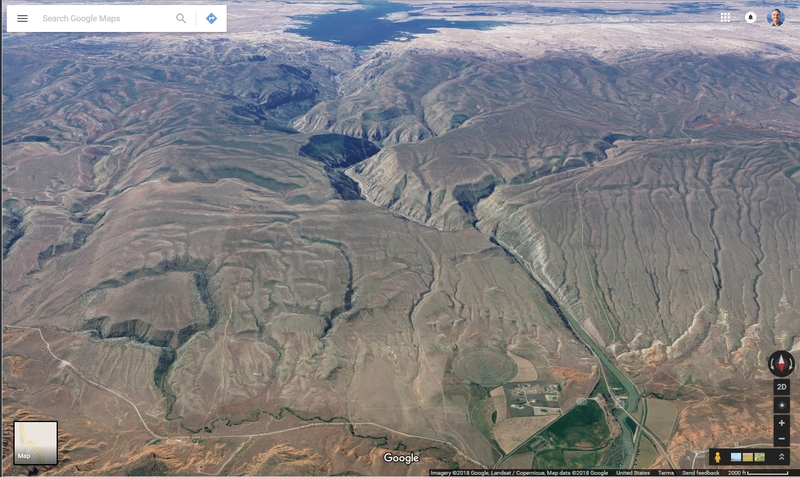 This is the Triassic Chugwater Formation that creates most of the distinctive red landscapes in western Wyoming. It formed on the coastline in shallow water at a time when North America was in the tropics near the equator. The Chugwater forms the red cuestas (low-angle ridges) on the north side of the Owl Creek - Bridger Mountains. Wind River Canyon looks like a yawning maw where highway 20 enters. The erosion-resistant layer capping the range is the Permian-Triassic Dinwoody limestone. Perhaps you'll encounter the optical illusion that struck me the first time here -- the river seems to be flowing uphill! It flows gradually up-section, from older rocks to younger, and since the rocks are tilted northward and the river also flows northward, it seems like it's flowing uphill. Or maybe it's just me. The solid high cliffs are the Pennsylvanian Tensleep sandstone. It's cross-bedded like the Navajo Sandstone at Zion National Park in Utah, but it's white to light gray. It forms an important oil reservoir in much of Wyoming. Most of the formations are labeled with highway signs where they reach the road, and there are many well-placed turn-outs so you can get out to look. The canyon experienced big debris flows and landslides in heavy rains in 2010, which destroyed parts of the railroad and highway. You may still be able to see scars where the vegetation is younger than elsewhere. The thickest cliffs in the canyon are the Mississippian Madison Group, deep marine limestone. The Ordovician Bighorn Dolomite is immediately below it. You can tell the two apart by the Bighorn's whiter overall color and coarser texture. This is the same Bighorn Formation at Medicine Wheel in the Bighorn Mountains (see the post here). Because the Cambrian formations are shaley and are sandwiched between cliff-forming rocks above and below, they're often found in the widest sections of canyons near the river. 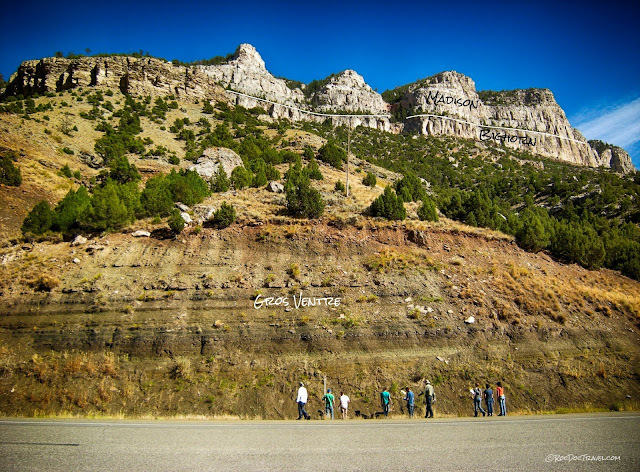 You couldn't ask for a better place to learn basic stratigraphic principles than Wind River Canyon. 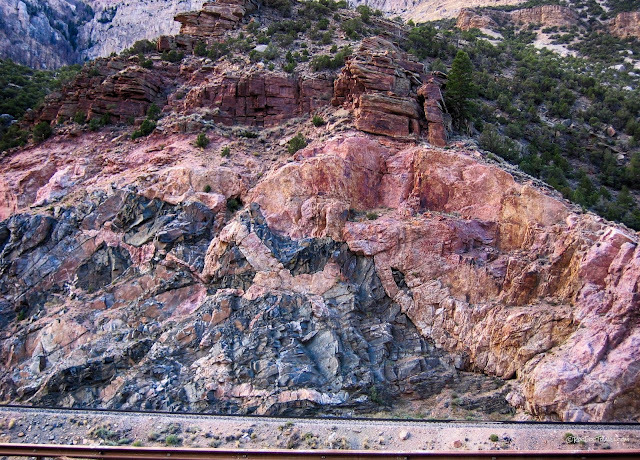 This view shows how more erosion-resistant rocks form cliffs and less resistant rocks form slopes. 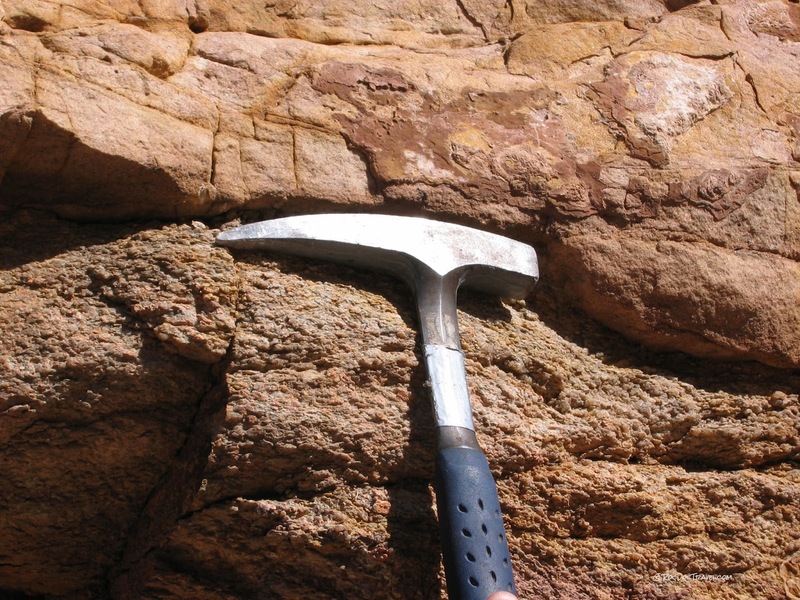 That simple principle allows geologists to make educated guesses of rock types from miles away. Geologists look for fossils and examine the intricate layering of the Cambrian Gros Ventre formation. Standing on the Great Unconformity, this is the view up through Earth's long history. The big cliffs are the Madison and Amsden. 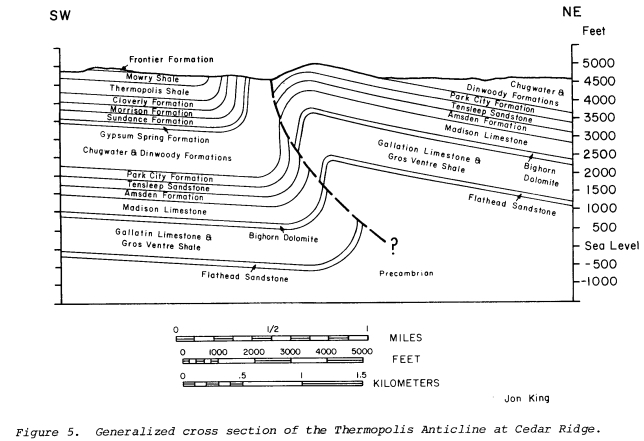 The Great Unconformity is one of Earth's, and certainly North America's, most significant boundaries. It is present all across the continent in places like the Grand Canyon, Las Vegas' Sunrise Mountain, Colorado's Red Rocks Amphitheater, in the Midwest, and many other places. I get chills every time I get to touch this greatest of geologic surfaces! It's a bit different at each location because the bedrock varies from place to place and the depth of weathering (break-down of rocks & minerals) varies. Here, the granites below are moderately weathered for several feet below the unconformity. This spot shows a channel (left) eroded down into the granite and filled with layered sandstone. For such an astronomical gap in time, the boundary is quite sharp. A little farther down the canyon, the Archean rocks are dikes of pink granite that were injected into metasediments and amphibolite. The Flathead Sandstone rests precariously on top of the Great Unconformity. The canyon is narrow and steep where the river is cutting down into the hard Archean rocks. It's so narrow, both the railroad and highway have to pass through tunnels. Looking southward at the southern end of the canyon, with highway and railroad tunnels. Southbound trains really roar through here! Looking northward near the south end of the canyon. Just outside of the canyon's southern end is a pleasant little campground called Lower Boysen. In 1908, a dam was built at this site by Mr. Boysen, but unfortunately it was filled by sediment-rich flash floods in less than 20 years. You can still see the sediment terraces at the campground. The present dam was built farther south in the 1940's and is vital for irrigation and flood control. By the way, this is a fun swimming hole! 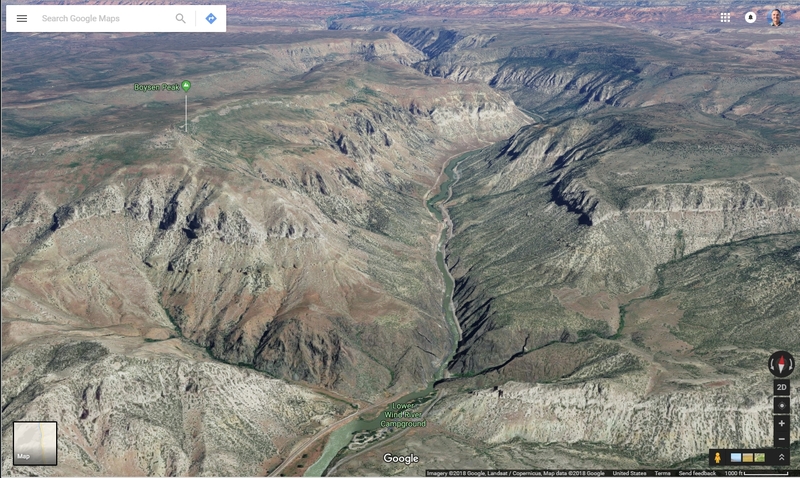 A Google Maps 3D view northward from the south end of Wind River Canyon. The Lower Boysen campground is at the bottom of the picture. The south end of the canyon is cut by a normal fault that drops the bedrock down to the south (it's at the boundary between dark gray Archean rocks and light-colored Paleozoic rocks across the bottom of the view). 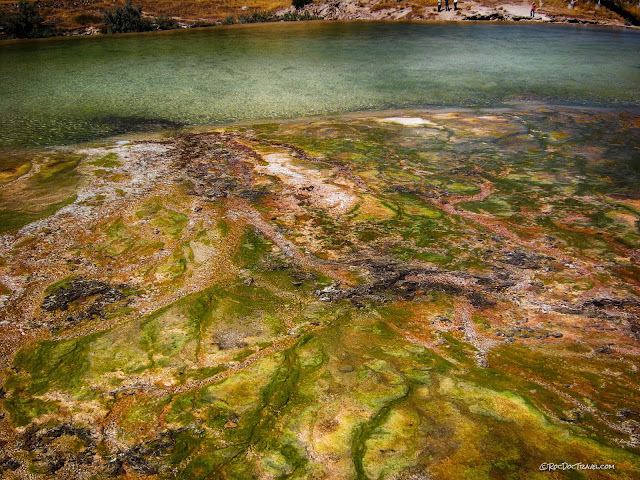 It's a myth that all hot springs are connected to magma or volcanic activity. 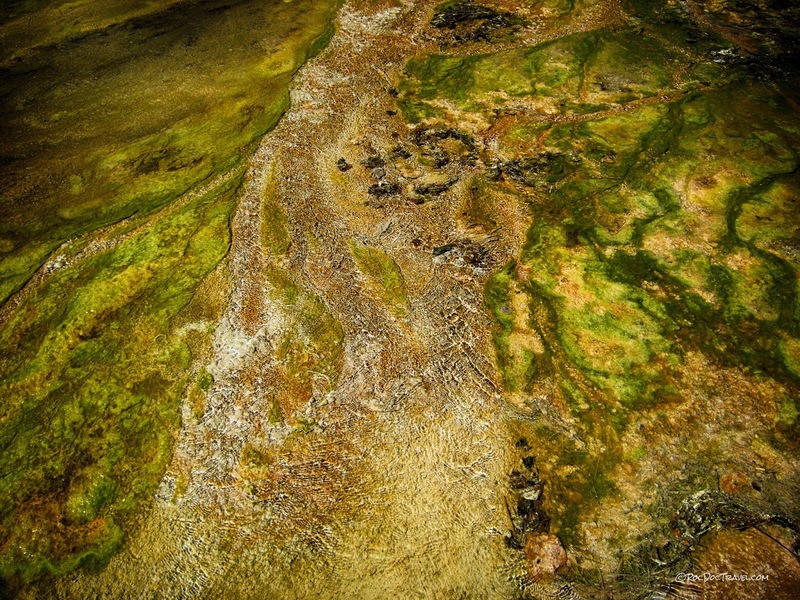 Earth's natural geothermal gradient is sufficient to warm groundwater at depths of several thousand feet. All that's needed is a sufficient supply of groundwater and fast paths for the water to flow upwards (like the faults at Thermopolis).